What’s the best way to wash down some delicious red velvet pancakes? With a red velvet latte of course! Local MBassy has the best of both. The cafe’s signature dish is its vibrant stack of red velvet pancakes, so popular that they now offer it in waffle form too. The talented barista can whip up a variety of specialty drinks including hot taro lattes and frozen mint chocolate cream frappes. It’s a great food menu too. 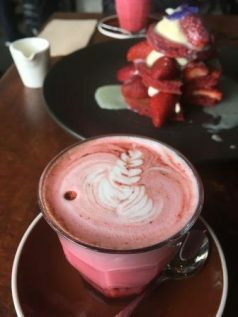 Grab a Mediterranean Brekky in the morning, Bacon Wrapped Chicken in the afternoon and squeeze red velvet pancakes somewhere in between.